Portable oxygen machine technology has changed dramatically, and with the latest portability advances, oxygen users can now operate their oxygen machine any time and virtually anywhere. Top portable oxygen machines from Inogen, Respironics, Invacare, and SeQual are designed for individual’s needs and vary in features, dimensions, oxygen flow types, liters per minutes, and specifications. Browse the Top-Ranked List of Portable Oxygen Machines below along with Product Features and Customer Reviews. We carry the largest selection of new mobile oxygen machines and are confident that our Oxygen Specialists can assist in researching and finding a unit that fits your needs and lifestyle. If you have any questions about any oxygen equipment, please contact us by 877.774.9271 or chatting online right now. 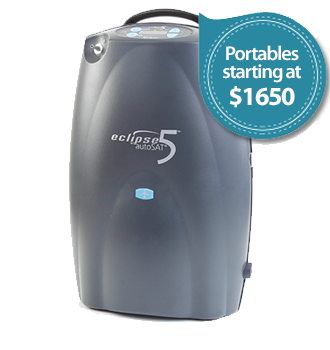 Includes the eQuinox unit, 24 cell battery, AC power supply, DC power cord, cart, accessory bag. The performance of portable oxygen machine is divided into two categories – either pulse dose only or pulse and continuous flow. Pulse means that instead of delivering oxygen with a flow that is continuously flowing to the patient’s nostrils, it is delivered in short spurts of oxygen called a bolus when the user inhales. Pulse dose in a portable concentrator allows the machine to have a lighter and smaller compressor also helps to extend the battery life for the same reason. Pulse dose and continuous flow can toggle between each method at the press of a button. This can be very beneficial because it allows users to choose the between the two forms of oxygen delivery. Pulse Dose: Intermittent oxygen delivery, smaller unit, battery conserving. 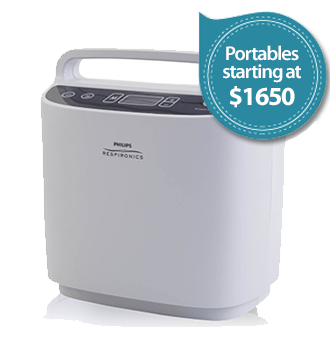 Portable oxygen machines are considerably lighter in weight than a home unit. The lightest portable oxygen machines on the are a mere 2 pounds with the more larger, and more powerful units averaging between 15 – 20 pounds. The weight variation is correlated to performance as smaller units are "pulse only" machines and typically have fewer flow settings. Machines weighing over 8 pounds typically include a wheeled travel cart. Most patients cannot tell the difference between an 8-pound and a 15-pound unit when rolling it with a wheeled travel cart. Battery life varies across units, battery size, and settings. A battery will have a longer life on a low pulse dose setting versus a battery on a high continuous flow setting. 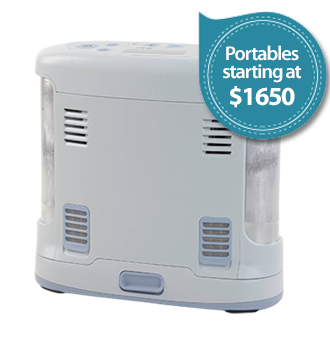 Most portable oxygen machines use lithium-ion batteries. There robust and long performing batteries are similar to most cell phones computer batteries. Batteries will degrade over time. Testing suggests that a lithium-ion battery can be recharged approximately 300 times without significant degradation, and manufacturers recommend periodically cycling batteries and keeping them out of temperature extremes to extend battery operating life. It is recommended that before traveling, talk with your doctor about your plans. If you are visiting a location with a different altitude, extreme temperature, or a dusty/damp environment, you’ll want to discuss the way in which it will effect your equipment and oxygen delivery. They are considered safe by the FAA and TSA and allowed on airplanes for flights. If you travel by flying, it is important to contact your airline in advance of your trip. Most airlines require additional paperwork such as a physician or doctor statement and documentation of your need to travel with oxygen. Partial List of Major Airlines that Permit Oxygen Machines: Air Canada, Alaska Airlines, American Airlines, Delta Airline, Frontier Airlines, Hawaiian Airlines, Island Air, JetBlue, Republic Airlines, Southwest, Sun Country Airlines, United Airlines, U.S. Airways, West Jet, Virgin America and Virgin Atlantic.